Introducing new reprints by Gerald Heard: The Creed of Christ The Code of Christ Training for the Life of the Spirit Prayers and Meditations ""There was a period in my early thirties when these four small books by Gerald Heard served almost as my bible. I read and reread them, and invariably found them to be uplifting and inspiring."" - Professor Huston Smith ""Gerald Heard was an inspiring voice for the life of the spirit. Wipf & Stock is to be commended that Heard's remarkable work is being made available to a new generation of spiritual seekers."" - Dr. William H. Forthman The Code of Christ is Gerald Heard's sequel to The Creed of Christ. In this volume Heard emphasizes how, ""Christianity is in essence a way of life for us to live."" 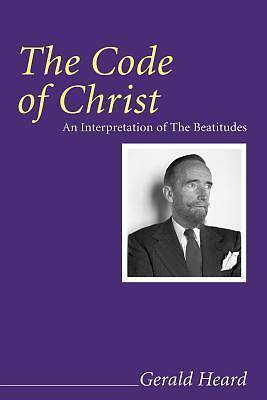 That way of life is systematically presented in the Beatitudes, which contain, ""a message needing decoding."" Heard authoritatively decodes this central message of Christ: ""The world exists for man to achieve union with God. The universe and life are the means whereby souls achieve Enlightenment and Liberation."" Once enlightenment is achieved, the ""perfected soul...turns back and stands incandescent with compassion, to light others on their way home."" The Code of Christ is essential reading for those desiring a deeper understanding of Christ's message. Gerald Heard's thoughtful musings skillfully expound the mystical truths of Christianity. ""Gerald Heard's learned insights help one to climb from within the rungs of the spiritual ladder."" - Dr. (Hon.) Rhea A. White Gerald Heard (1889-1971) was a well-known author, philosopher, and lecturer. Trained as a historian at Cambridge, he served as the BBC's first science commentator. Later, in California, he founded and directed Trabuco College, which advanced comparative religious studies. His broad philosophical themes and scintillating oratorical style influenced many people. Heard wrote thirty-eight books, including his pioneering academic works, several popular devotional books, and a number of mysteries.